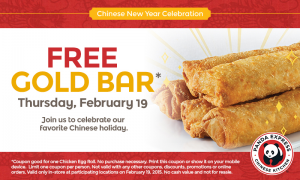 Panda Express is celebrating Chinese New Year tomorrow (February 19) in typical Panda Express fashion — by giving away free food! 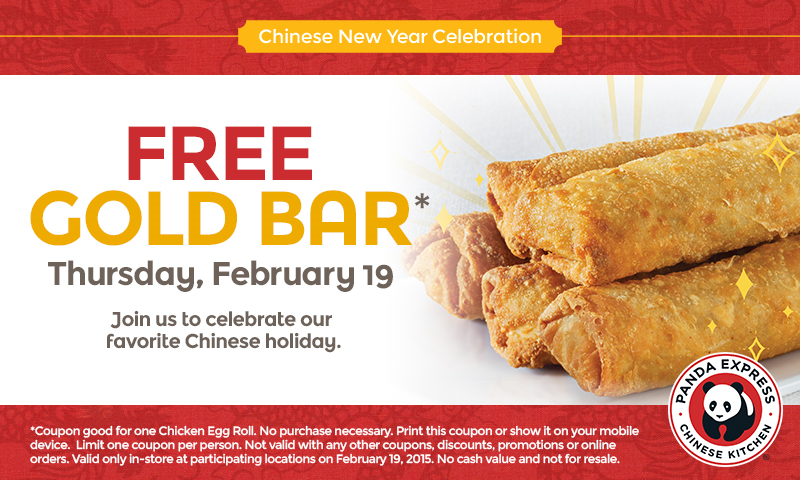 In this case, it’s a free gold bar — otherwise known as a chicken egg roll — with the coupon that can be found here. 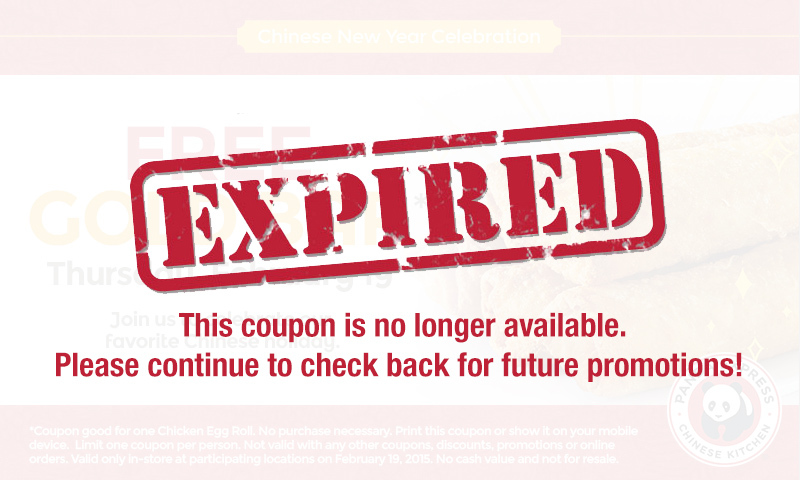 No purchase is necessary, and you can either print the coupon or show it on your mobile device. 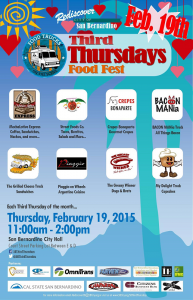 It sure seems like it’s been longer than a month, but downtown San Bernardino’s Third Thursdays Food Fest is tomorrow (February 19). The event takes place from 11 a.m. to 2 p.m. in the city hall parking lot on Court Street between D and E streets. 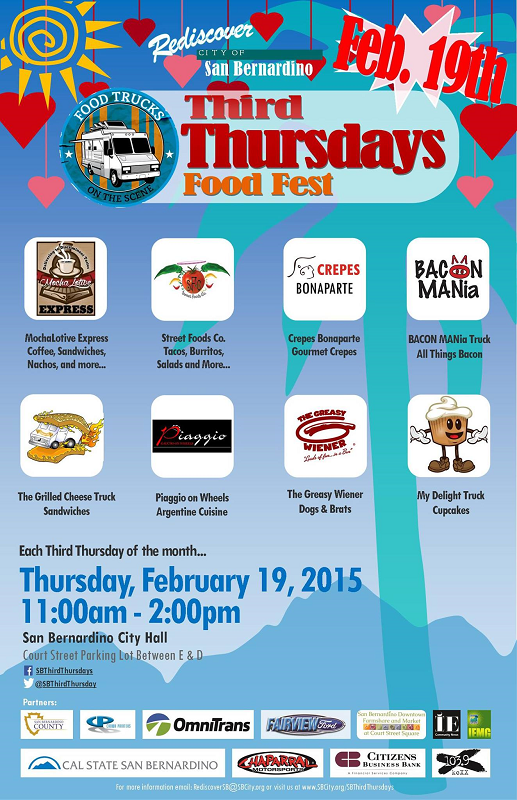 All the usual suspects are scheduled to serve: Bacon MANia, Crepes Bonaparte, the Greasy Wiener, the Grilled Cheese Truck, the Mocha-Lotive Express, My Delight Cupcakery, Piaggio on Wheels, and Street Foods Co.
Ride the sbX to the event and receive a $5 voucher to spend at any of the food trucks. For updates and more information, visit the event’s Facebook page. Fans know Carolyn’s Cafe in Redlands is a great spot for breakfast or lunch. However, man (and woman) does not live on breakfast and lunch alone. 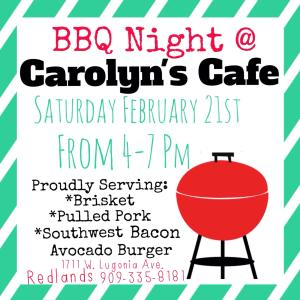 So, Carolyn’s Cafe is hosting another of its rare BBQ Nights this Saturday (February 21). The restaurant will be serving pulled pork and brisket plates and sandwiches and a Southwest bacon avocado burger, along with side dishes and desserts — including Carolyn’s deliciously decadent coffee cake. The event will take place from 4 to 7 p.m., but you probably want to get there early to avoid any sell-outs. Carolyn’s Cafe is at 1711 W. Lugonia Ave., Suite 101. Circus Vargas and the giant pumpkin patch/Christmas tree lot are going to have to find a new home. That’s because a Golden Corral is planned for the southeast corner of Waterman Avenue and Hospitality Lane in San Bernardino — right where those temporary businesses are usually located. It’ll be the fifth Southern California location for the buffet chain, following Hesperia, Industry, El Centro and a planned Bellflower restaurant. No opening date has been set. 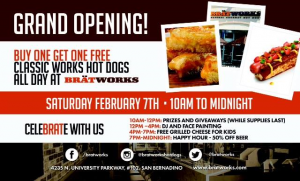 Although San Bernardino’s Brätworks has been open several months now, the gourmet hot dog shop is celebrating (or is that cele-brät-ing?) its grand opening tomorrow (February 7). Head to the San Dimas Philly’s Best today (February 5) to pick up any sandwich for just $5, and while you’re there (or at any Philly’s Best location), you can also save $7 off advance Circle K NHRA Winternationals ticket purchases (or save $5 off tickets at the raceway). The sandwich deal is good today only at the San Dimas location, 806C W. Arrow Highway.